Heading into today’s qualifying session, based on the evidence thus far, Sebastian Vettel had every right to believe that the only man standing between him and pole position for tomorrow’s Singapore Grand Prix was his teammate, Kimi Raikkonen. However, a mega-lap from Lewis Hamilton, and a pretty decent effort from Max Verstappen, mean that Vettel will start from the second row tomorrow. 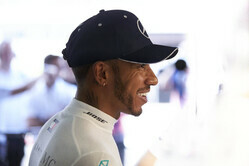 Speaking in the moments after the session, a clearly delighted Hamilton seemed almost as surprised at the result as his German rival. “I was thinking, there’s no way I can find half a second,” he admitted. “But in that last session it was about pulling all those bits in practice and trying to put it into a perfect puzzle… 99.9% of the time it doesn’t go right. “But that lap, I didn’t have wheelspin, I didn’t have a snap anywhere, the car was just underneath me and I managed to maximise it at pretty much every corner. I can’t remember one where I thought I could do more. “The second lap I tried to go that little bit more, brake half a metre later,” he said of his final assault, “but it was too much, the car wasn’t going to have it. I feel I got everything possible in that first lap. Previous Previous post: Opinion: Will ‘Big 3’ stay intact on road to Miami?